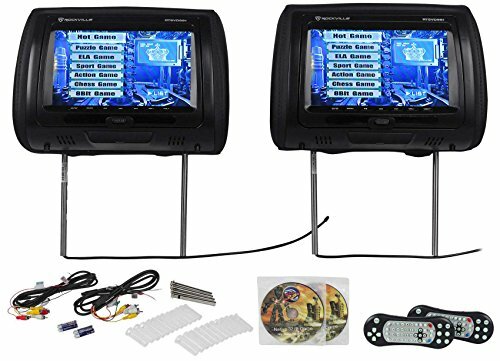 The Rockville RTSVD961 is a 9"" complete touchscreen car video entertainment system. The RTSVD961 features a universal fit system and it includes all the necessary parts to fit any vehicle. It has adjustable and detachable metal poles that adjust left to right from 4"" inches to 7"" inches.Rockville will have you up and running and enjoying your system in almost no time. Rockville takes the rocket science out of system integration, with ourdetailed and easy Do-It-Yourself Instructions. (Our instructions are written so that it is easy to understand). The headrests are manufactured of high qualityleatherette with a plush comfortable finish and modeled to integrate perfectly into any vehicle. This is one of the only units on the market with an HDMI input. This will allow you to connect an iPad, or any other device that can connect via HDMI. Two headrest are included. These monitors have full touch screen controls, making them really easy to operate. Each headrest has abuilt-in DVD Player, USB, and SD slot, and video game controller. Since this is a dual DVD system, it allows the ultimate versatility. You can play a DVD in one headrest while playing a video game in the other. You can watch one DVD in one headrest while playing a totally different DVD in the other. This system basically allows each passenger to independently use any source of the unit while the other passenger can use a totally different source. All Rockville DVD units are manufactured using original Sony laser lens pick ups for the absolute best DVD playability. No skipping or pausing. And even home made discs will play with no problem. Our loaders and spin motors are Japanese made by Mabuchi the world leader in DVD spin technology. This is one of the major differences between Rockville and some of the other brands.